I recently got a new mobile phone to replace my trusty HTC which was pretty well worn after 3 years use. It’s a Samsung smartphone so it has a touchscreen and because it was so new and shiny and smart, I thought I best get myself sorted for a cover to help protect the screen from wear and tear. I couldn’t actually find a sock that I liked or wanted so I thought hey, why not just make your own! So I did, and after a few hours the sock was finished and in use. 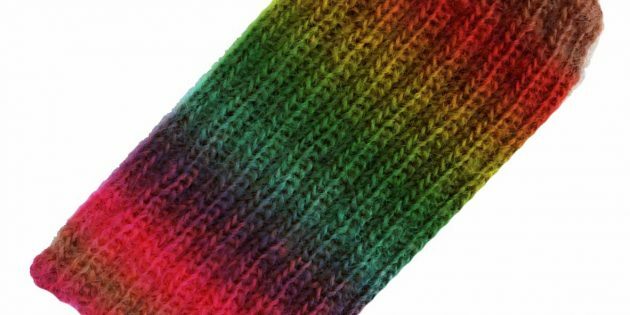 Just follow my steps below and you should be able to make your own unique phone socks – It’s quick and simple. This approach works for all types of touch screen phones, or other gadgets such as iPods. As you can see, I made my phone sock in a really brightly coloured wool – and that’s so I can find it at the bottom of my bag really easily, even on a dark winter’s night! It’s knitted in double rib so that it can stretch over the phone and fit snuggly. Nothing worse than having your cover too big or it’ll keep falling off at the worst moment. Measure your phone all around – width, depth and length. Pick your wool – double knit works well for this. From the next row until length required is reached, follow double rib pattern. Remember you’ve made enough to cover the entire phone with one side seam and one bottom/top seam. Using slip stitch, stitch the seams together with right sides facing. I hope these quick steps will help you make covers for your own phones. If you’re new to knitting and want to learn the stitches and techniques, then why not come and join our knitting club.